The annual Lincoln Christmas Market will open to visitors at 12pm on Thursday, December 4, with attractions and shopping opportunities for all the family. The event is the oldest traditional Christmas market in the UK, and annually attracts thousands of visitors and around 200 stalls. The market is now in its 32nd year and kicks off on Thursday with a traditional residents’ day. Visitors to the market then continue to enjoy the event until Sunday, December 7. This year, Santa will take time out of his busy schedule to visit the market. He will be based in Wickham Gardens, near to the Water Tower in Westgate. In addition to popular stalls, visitors to the market can enjoy a funfair and big wheel with spectacular views of the city, toys, crafts and food and drink. On Thursday evening, the market will be officially opened by the Mayor of Lincoln Councillor Brent Charlesworth at 6.30pm on the steps of the cathedral, followed by a special Christmas blessing delivered by the Dean of Lincoln Cathedral. For Lincoln Christmas market updates, you can follow @lincolnelf and use #LCM2014 on Twitter or @lincolnchristmasmarket on Instagram. As in previous years, The Lincoln Christmas Market is divided into a number of zones, spanning the castle, cathedral and surrounding roads in uphill Lincoln. 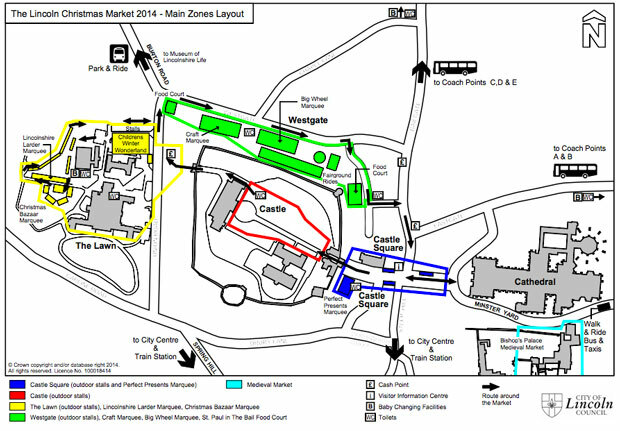 This year, due to The Lawn being up for sale, the layout of the market map has been changed and there are no longer indoor stalls at The Lawn. A new layout will also see the Perfect Presents Marquess relocated to Castle Hill, which the food court has been moved to St Paul in the Bail. The market will feature a one-way system through the castle for visitor safety. Should there be a high turnout, additional one-way systems may be introduced in other areas. There will be around 200 different stalls to browse, all offering a variety of items. Many of the stalls are from the Lincolnshire area. Lincoln brought the first traditional German market to the UK as part of its twinning with Neustadt. A typical theme of German crafts, food and drink has remained, though there are also plenty of entertaining activities for the kids and fresh produce from the local area. There are lots of shopping opportunities for adult gifts such as accessories, homeware, ornaments and clothing. Stalls will be located in the castle grounds, Bishop’s Palace and, after a successful trial, seasonal chalets will be located at various points. There are also a number of independent Lincoln shops lining the route of the market. Shops, restaurants and bars will be open as usual during the market and offering seasonal trade. The Market Makers will also be on hand with some hidden secrets about the city and the market, and will be happy to answer questions. This year, the main food court will be at St Paul in the Bail, providing visitors with a large range of hot and cold dishes. There will however be plenty of food stalls throughout the market. There will be tastes from all over the globe to sample, as well as local delicacies and produce. For snacks, visitors will find roasted chestnuts and baked sweets, or even a hot roast or fish and chips for the bigger appetite. To stay warm while you walk, you can pick up a classic mulled wine from a number of catering stalls, or for something sweeter a Bailey’s Hot Chocolate (without the alcohol for the kids!). The Lincoln Christmas Market is a top event on the calendar for all the family and there are lots of attractions to keep the children entertained. Jingle, the Lincoln Christmas Market elf will join Santa at Wickham Gardens to receive wish lists from the events youngest visitors. There will be a special postbox to take them back to Lapland, so don’t forget your letters to Santa. Look out for Bubble Inc, which will be in the grounds of Lincoln Castle impressing crowds with giant bubble magic. There will also be a variety of stalls selling toys, crafts and entertainment. Entertainment will be on show during the Christmas Market from the Lincoln BIG stage. Sing along with traditional choirs, big bands and bop along to your favourite Christmas carols. Stop and watch at the White Hart Hotel on Bailgate for a break whilst exploring the market. More information can be found on the Christmas Market’s official website. A wristband scheme will be in place once again to reunite any children with parents who may have become separated. Free wristbands can be collected from the Visitor Information Centre at the top of Steep Hill and from stewards around the market. Please note dogs are not permitted at Lincoln Christmas Market, except assistance dogs. A souvenir guide for 2014 is also available to buy for £1.50 including postage. The official Lincoln Christmas Market guide will help you plan your visit to the market with details on stall holders, events in the city during the weekend and much more. Accommodation is usually booked up in advance of this event, however the Lincoln Vistor information centre hold information on available accommodation and rooms. They can be contacted on 01522 545458. There is no parking in the vicinity of the Christmas Market. All cars should use the dedicated Christmas Market Park and Ride service which operates from the Lincolnshire Showground, north of Lincoln. The park and ride site will be well sign-posted on all approach roads and for those using a sat nav the postcode is LN2 2NA. There is also a dedicated service for people with disabilities, using specially adapted vehicles which also runs from the showground. All busses drop off close to the Museum of Lincolnshire Life on Burton Road. You can book your park and ride tickets in advance here for £12, and that can be redeemed on any day of the market. Minibuses are also available for groups of between 8 and 15 at £25. On the day charges per car are Thursday £12, Friday £13, Saturday £15 and Sunday £14. Each residential household within the market area should have received a numbered Resident’s Vehicle Access Pass. When hung from the rear view mirror, the passes allow access through some of the road closures in the market area. If a resident needs extra passes, or needs a business permit, visit City Hall or the Visitor Information Centre in Castle Hill, with proof of address. A number of roads in the area will be closed or temporarily blocked while the market is underway. Traffic restrictions apply as and when necessary during the period 12.01pm on December 4 to 11.59pm on December 7. 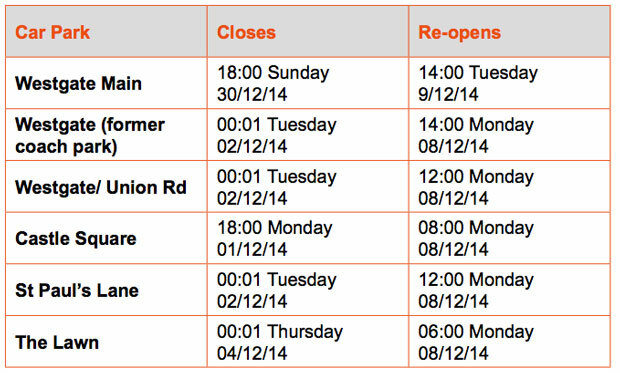 Lincoln car park closure and reopening times during the Christmas market. A number of local buses will be diverted around their usual routes throughout the Christmas Market. 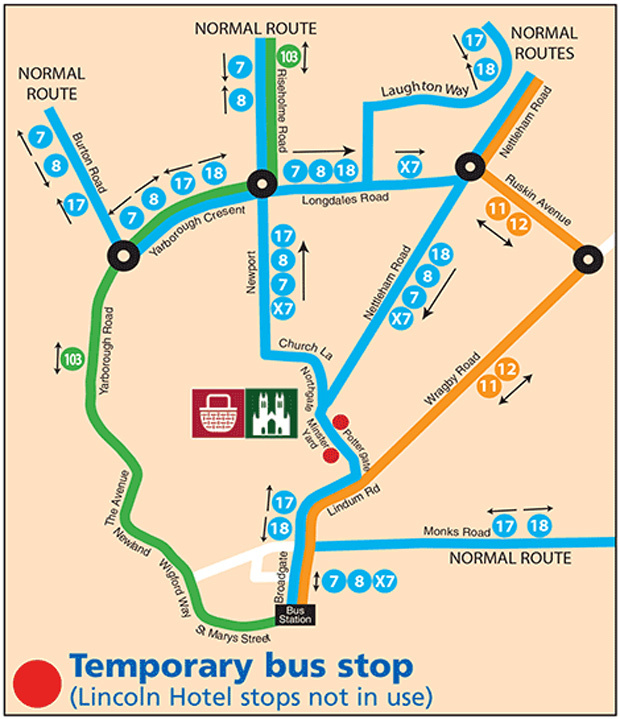 Diversions will be in place on the services 7, 8, 11, 12, 17, 18 & 103. Bus diversions during the Lincoln Christmas Market 2014. 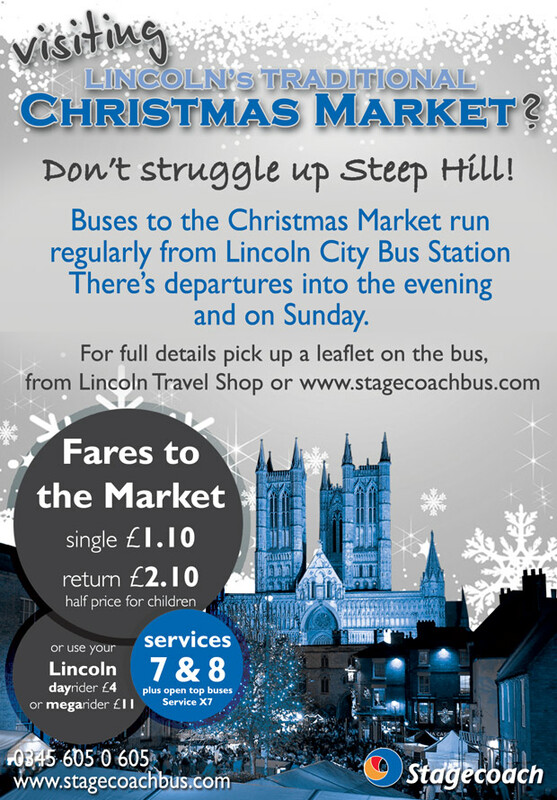 Extra bus services during the Lincoln Christmas Market. A number of coach operators will be running day and weekend trips to the Market from various parts of the country. You can find more information on coach trips to Lincoln on the National Holidays website. East Coast Trains is also providing extra services to and from Lincoln on December 6. A full list of East Midlands Trains services during the 2014 Lincoln Christmas Market can be found here.